This is another teaching with technology post (old posts here). This one is on Piazza, a course management system masquerading as a souped up discussion board. I used to use BlackBoard, which I disliked especially after it became clunky and cumbersome to use after “upgrades.” It’s hard to describe exactly why I like piazza so much, so I made a short video showing off some of its features. Time to upload and organize class materials. I use significantly less time on piazza than I did on BlackBoard. With a single click, you can post an announcement or send an email when you upload a file/video/link/assignment to piazza. Assignments and other resources are on a single page, so important documents don’t get “lost” in the system. When you log in, you can immediately see everything you need to do for your students (e.g., unanswered questions). Private messages on piazza replace emails from students, so everything is really all in one place. Great help posts and emails from the Piazza team to answer questions as you go. The best advice they have is to ask students to post their questions on piazza. When they email you instead, don’t answer. 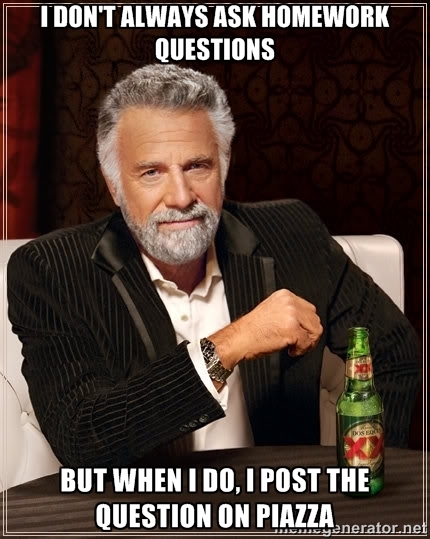 Instead, tell students that is a good question and that you will answer it once it is on piazza. I no longer have to answer every student question – they can answer their own and I can “endorse” a student answer. A meme I made and displayed in class (via the projector) to remind students to use piazza. This entry was posted on Wednesday, September 18th, 2013 at 1:04 pm	and tagged with teaching with technology and posted in Uncategorized. You can follow any responses to this entry through the RSS 2.0 feed.